As we continue to focus on healthy low-carb meals for January, I have to share one of my favorite veggie breakfasts! 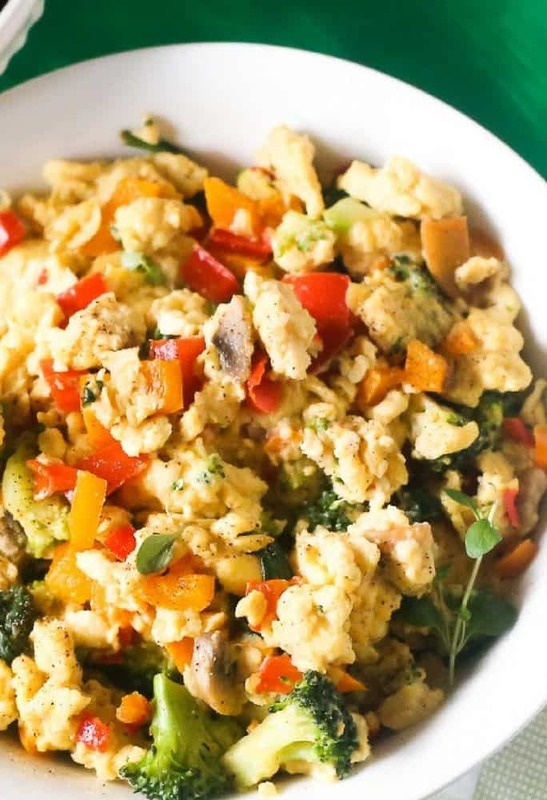 Now making scrambled eggs are a no-brainer but we often forget that healthy vegetables are awesome with scrambled eggs. 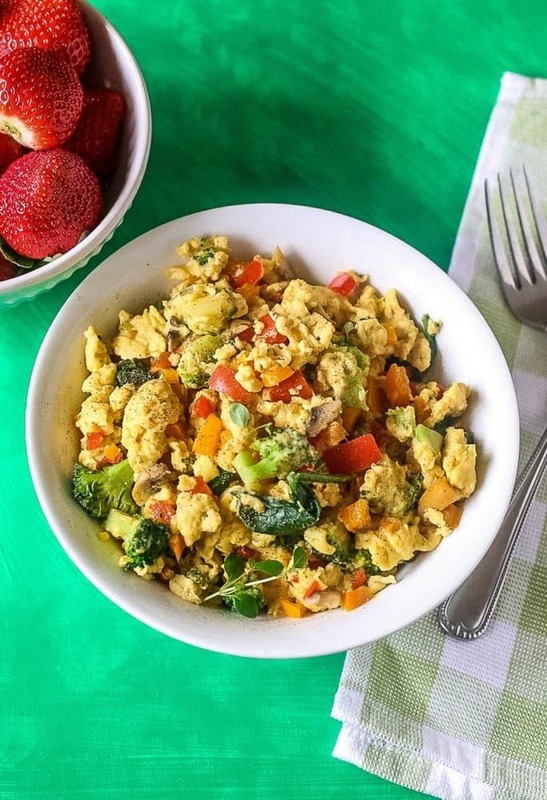 My favorite Healthy Veggie Egg Scramble is a perfect combo of veggies and eggs providing a great amount of protein!v This is also a great way to get added veggies to your meal. As a huge breakfast fan, this is a great combo of veggies! I use a bevy of my favorite veggies, feel free to adjust any veggies to your favorites! I also call this veggie scramble, my clean out the fridge meal! 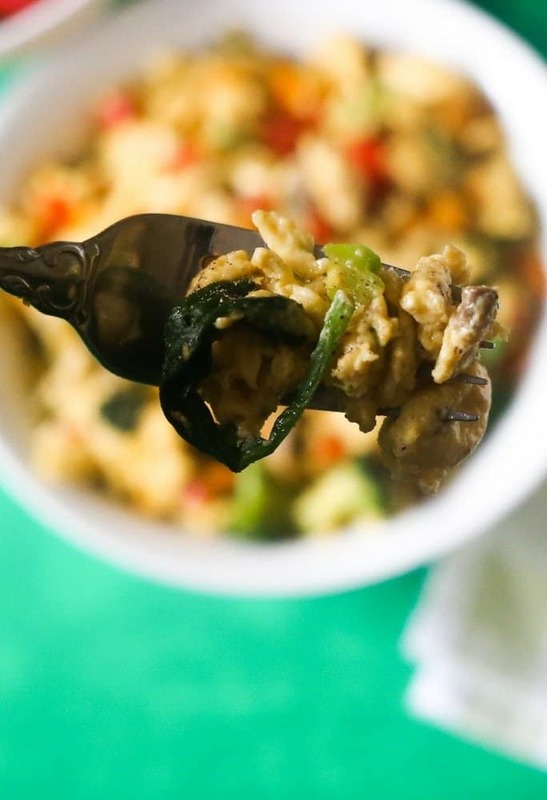 This egg scramble can use veggies in the fridge that need to be cooked. 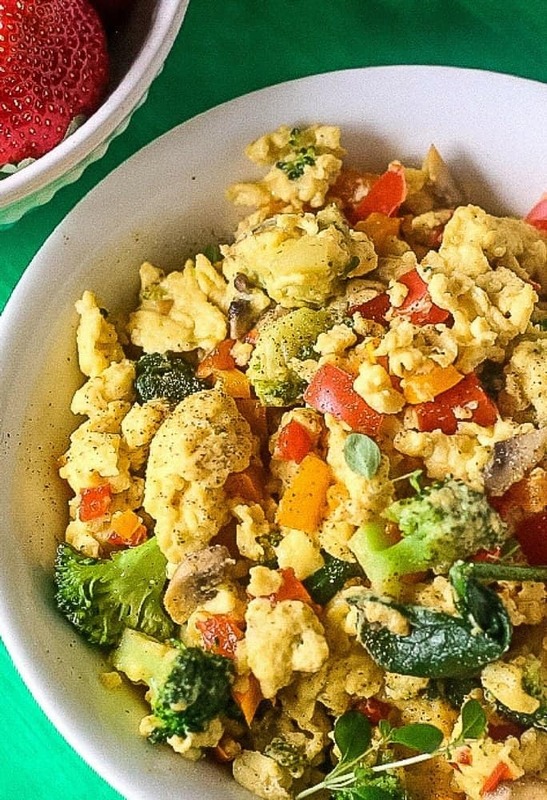 Those veggies can go into making this Healthy Veggie Egg Scramble! My base vegetables are usually broccoli, mushrooms, and peppers because I love them! Feel free to change-up the veggies to your favorites or what is in the fridge! Using the whole egg is the norm as I am looking for a hearty meal with protein and veggies. Cut Cholesterol by using half egg whites and whole eggs. Adjust vegetables to what is in the fridge or your favorites. Make a large quantity. Split into 3 containers to reheat during the week for a quick and healthy breakfast. When making the scramble, let the eggs settle for a minute. Then push eggs forward and gently fold over. Once eggs are just about done, transfer to plate and they continue to cook one more minute. Heat a medium skillet over medium heat spray the non-stick cooking spray. Add to skillet broccoli, mushrooms, red pepper, and orange pepper. Saute about 5 minutes until the veggies begin are soft. Add spinach and cook another 2 minutes to wilt the spinach. While the veggies are sauteing, in a medium mixing bowl add the eggs, milk, pepper, and salt. Whisk to completely blend the eggs. The longer the eggs are whisked, the fluffier they are when cooked. You can use egg whites in lieu of some of the egg for 1 egg use 2 eggs whites. If making for meal prep, separate into 3 food storage containers and either microwave to heat or reheat in the oven at 350 for about 5 minutes in an oven-safe bowl. The nutritional guide is based on 6 eggs. We went low-carb for january. We have been making your eggs since last january/. They are delicious and as you said to vary the veggies to what is in my cupboard, we do! Thanks for this yummy recipe! You made my da Denise! I am so glad you enjoy my veggie egg scramble! They are easy and I do use whatever veggies I have in the house! I just love egg and i always try out diff egg recipes. 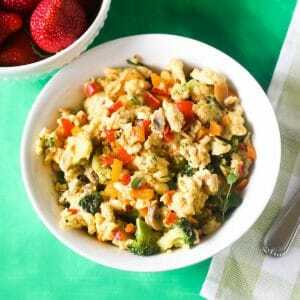 This egg scramble is looking to yummy and very healthy too. Thanks for sharing in such a detailed way.amazing work. Thank you Tejaswini, enjoy the veggie scramble! Thank you Lisa! I agree healthy eating is the way to go and it tastes great! Thank you so much for the kind comment! Thanks for the recipe. I am always looking for a way to get more veggies in. I think I will take Jason’s advice on adding the turmeric as well. Awesome! The turmeric will add both antioxidants and great flavor. I would love to hear how the recipe went for you. Jason, turmeric would be a great addition to these egg. I would also make a cup of green tea and add in turmeric to the tea, for extra antioxidants! I am glad you enjoy the recipe!